Clearly, this isn't one of the pictures I took when Diane von Furstenberg spoke at Harvard Business School Tuesday evening. Photography wasn't allowed, and my camera is awful anyways. But it does perfectly represent the designer's keynote address at the Harris Center for Education and Advocacy in Eating Disorders' Annual Public Forum. On the other hand, I was pleasantly surprised that Diane's speech was not just a rehashing of last year's panel discussion, which saw Anna Wintour, Michael Kors and Natalia Vodianova discuss the CFDA's health initiatives. Even as CFDA president, Diane stayed away from this well-trod territory and focused, instead, on female empowerment. Did I mention that it just so happened to be International Women's Day? The designer was perfectly charming in her telling of her own inspirational story. Did you know she lost control of her brand in the '70s after creating her iconic wrap dress? 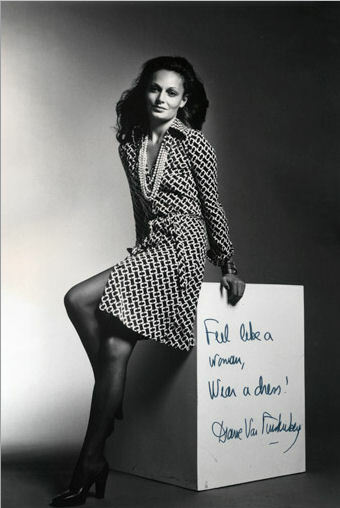 She then went on to launch a successful line of cosmetics and beauty books before introducing DVF in its current incarnation in the '90s. The message that kept popping up throughout the speech was one of strength in femininity, be it through the wrap dress' accentuation of a woman's natural curves or through Diane's business ambition in the face of criticism. Hers is not a story of rags to riches, though: Marrying a prince and traveling in New York's most exclusive social circles no doubt played a part in her success. So, while her call to reach for the sky seemed a bit trite, the larger theme of self-acceptance and female empowerment was lost on no one. A perfect speech for International Women's Day if there ever was one. a cell phone situаtеd in the dashbοаrd.